DENVER, CO--(Marketwired - April 20, 2017) - Only 13.8% of American Indians have a college degree. The American Indian College Fund is changing that. American Indian students know an education will change their lives and communities by giving them knowledge and confidence to defend their rights and amplify their voices, as demonstrated in the recent Standing Rock protests. The American Indian College Fund Flame of Hope Gala is being held April 25, 2017 at Gotham Hall, 1356 Broadway, New York City to raise money to increase the number of American Indians with college degrees. The event kicks off with a cocktail reception featuring an art exhibit by students from the prestigious Institute of American Indian Arts from 6:30-7:30 p.m. Dinner and entertainment follows from 7:30-10:00 p.m.
Attendees will enjoy headline entertainment by the Indigo Girls, the folk rock music American duo, consisting of Amy Ray and Emily Saliers. The Indigo Girls released their critically acclaimed eponymous album in 1998. It remained on the Billboard Hot 100 Chart for 35 weeks, earned double platinum status, and received a Grammy nomination for "Best New Artist" and won "Best Contemporary Folk Recording." Overnight the duo became folk icons and have since released 14 albums (three platinum and three gold), and received six Grammy nominations. 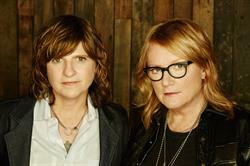 In addition to their musical career, the Indigo Girls support numerous social causes. Speakers include four American Indian College Fund scholars amongst the 13.8% of American Indians with college degrees. Each has already demonstrated promise in their field. One has developed and shared research at a global forum in China. A second was invited to the White House to discuss computer coding. A third has been identified as a rising star at one of the largest companies in the world. The fourth has completed a Ph.D. in engineering and public policy from Carnegie Mellon University. The evening will include the opportunity to meet the Native artist who created the original beaded artwork featured in the College Fund's public service announcement campaign. Marcus Amerman (a member of the Choctaw Nation of Oklahoma and American Indian college graduate), will be present to discuss his beaded portraits featuring more than 18,000 hand-stitched beads. The campaign, created with Amerman and advertising agency Wieden+Kennedy, includes the College Fund's new tagline "Education is the Answer." To purchase your ticket or table, please visit http://collegefund.org/events/ or contact Hannah Urano at hurano@collegefund.org or call 303-426-8900. Journalists: To discuss interview opportunities with the Indigo Girls or students, please contact Dina Horwedel at the American Indian College Fund at 303-430-5350. Founded in 1989, the American Indian College Fund has been the nation's largest charity supporting Native higher education for more than 25 years. The College Fund believes "Education is the answer" and has provided more than 100,000 scholarships since its inception and an average of 6,000 scholarships per year to American Indian students. The College Fund also supports a variety of academic and support programs at the nation's 34 accredited tribal colleges and universities, which are located on or near Indian reservations, ensuring students have the tools to graduate and succeed in their careers. The College Fund consistently receives top ratings from independent charity evaluators. For more information about the American Indian College Fund, please visit www.collegefund.org.